I changed up a few things in the recipe and it completely changed the drink for the better. This time splitting between Mezcal and Tequila Reposado and muddling a couple slices of Serrano pepper to add a bit of a spice element which I love pairs with Mezcal as you know, and this time making the sour without egg white. Slice a couple thin slices of Serrano pepper, muddle into glass, add ice, add Mezcal, Tequila, Lemon and Agave. Shake vigorously for about 15-20 seconds and strain into chilled coup. Float red wine on top. Garnish with ring of rosemary. 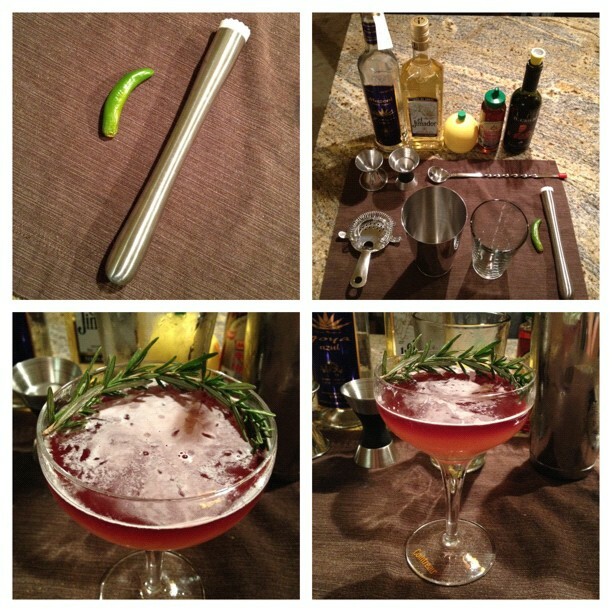 Tags: Agave, Mezcal, Serrano pepper, Sour, Tequila. Bookmark the permalink.